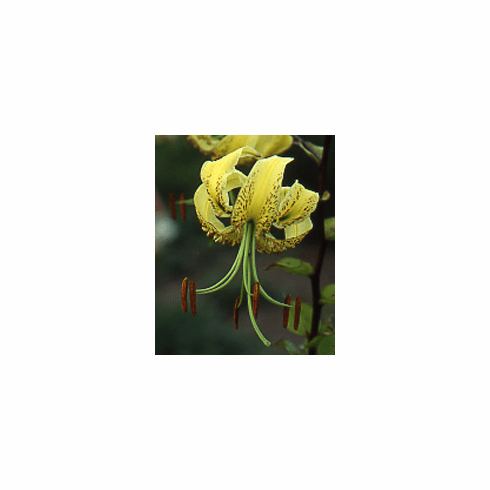 The rare and beautiful yellow color form of Lilium henryi has not been often seen in commerce. Though quite beautiful, and easily grown, its main drawback is a weak stem, long droopy pedicels and a need for staking. For this reason, commercial breeders held little interest, which probably accounts for it not being as commonly offered in catalogs as its orange counterpart. When left undisturbed, bulbs in excess of 25 inches in circumference and three to five pounds are not unusual, with stems exceeding 8 feet. Lilium henryi citrinum likes a well drained, fertile garden loam and full sun. We have put Lilium henryi citrinum back into field production and will again list it in the future. Photo inserts #1 and #2 are of L. henryi var. citrinum 'Ypsilanti' as provided by Charlie Kroell and Rimmer De Vries. Photo insert #3 is an example of L. henryi var. citrinum as grown by Edgar Cline in the late 1940. Photo from Bill & Mary Hoffman.